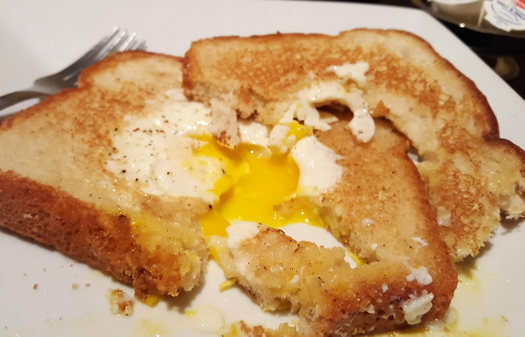 Egg in the Bread is just as it sounds: an egg, cooked in bread. But do not be deceived by that simplicity. The bread here is perfection, and the ratio of burnished crumb to chewy texture makes for the most excellent piece of toast. The menu points to the bread coming from Bella Napoli, and it serves as an exceptional vessel for a smattering of jelly. My only complaint is that the rounds of bread removed to accommodate the egg do not appear on the plate. Then comes the egg. 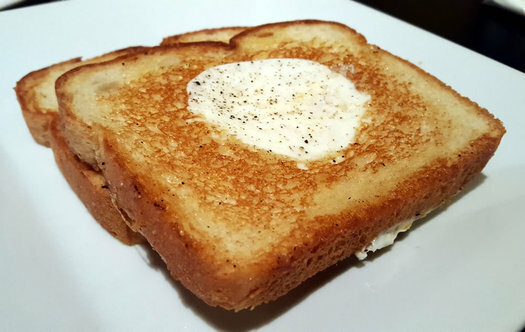 Once the bread is buttered and toasted on one side, it is flipped and an egg is added to the middle. The egg is then fried until the white is set and the yolk is slightly molten in the very center. The yolk, when cut, does not seep and dribble down the plate, but does provide enough runny moisture to dip a crisp crust into. Don't hesitate to sop-up the yolk with remnant bread. 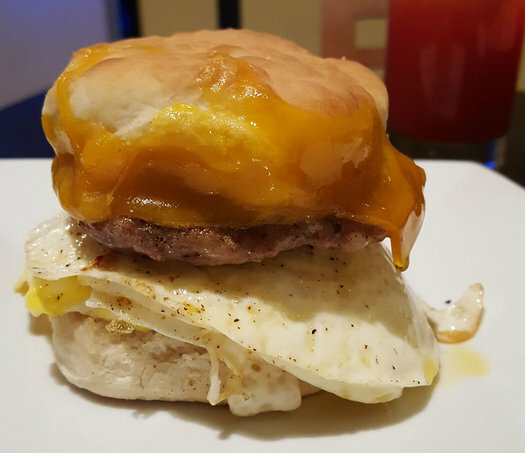 I also ordered the breakfast sandwich with egg, sausage, and cheese on a housemade biscuit ($6.95), which while delicious paled in comparison to the gastronomic comfort brought by the Egg in the Bread ($5.95). I also ordered the Ducky Shincracker ($2.95), a combination of cranberry, orange, and apple juice that tastes exactly like Hi-C without the sticky high fructose corn syrup. Altogether, it made me feel 8 years old again, home on a sick day and allowed to watch cartoons on the couch with a thermometer intermittently under my tongue... but in a good way. The way that felt like I was the only care in my mother's world. It is rare that a simplistic meal can be so transcendent, but then again, few things can offset illness the same way a mother's loving care can. Next time you feel malaised, perhaps The Breakfast Spot, an offshoot of the Lake George sister location, can assuage you, too. Why are there no options on this site to share stories on social media? I'd like to post this to Facebook and can't believe you don't have buttons to do so! It's an easy way to drive traffic to your site ... get with the times, All Over Albany! I went there a couple weeks ago, the food was very well prepared, but a bit pricey for what I got (maybe $1 too much per item). I guess that is the trade off for quality breakfast foods, but $6 for 2 eggs and 2 pieces of toast is a little too much, IMO.